WORLD WHALE BUZZ: BAY OF FUNDY WINTER WHALES OFF THE WOLVES!! BAY OF FUNDY WINTER WHALES OFF THE WOLVES!! The following observations of "at least 6 large whales" off the Wolves on February 18th is, I think, very unique. Add to this the recent concentrations of right whales a short distance from here and we have a mystery for sure. Is this a shift in winter feed? A measure of global warming and post glacial range shifts? Are the whales responding to abundant food or a lack of food somewhere? Anyone got ideas about this? Personally I think the whales are responding to a lack of feed everywhere else on the east coast. We know the herring have disappeared further south. We have had many concentrations of ducks around the island , more so than I am used to seeing and I think the same thing applies to the sea ducks. I hope I am wrong. There may be a shift northwards because the warming makes it possible to for them to stay in less populated areas. 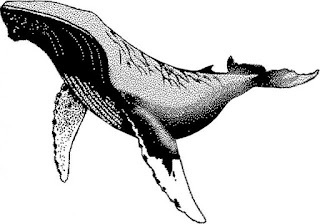 What do the whale experts think?